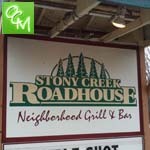 Stony Creek Roadhouse Shelby Township Review, hours, and menu info. You may recall this restaurant back when it was called the Lion’s Den Pub back in the 80’s. Before that, it began as Mt. Vernon Lodge in 1960. But, in 1993, the Lion’s Den Pub became Stony Creek Roadhouse, a cozy restaurant with an up north lodge feel. Stony Creek Roadhouse has come a LONG way since the Lion’s Den Pub days when the restaurant was a dark sports bar. Stony Creek Roadhouse has a nice reputation from locals now as a great, family friendly restaurant. The Stony Creek Roadhouse makes for a great hangout with its casual atmosphere and warm, wood accented up north decor. The staff is welcoming, genuinely kind, and offers up some nice customer service. If you’re familiar with G’s in Lake Orion (or G’s locations in “Up North” Michigan), Stony Creek Roadhouse reminds me of that in terms of style. If you’re looking for a family friendly cozy hangout, this is a good choice. It’s also a nice option for kicking back with a few drinks and watching the game, large group special occasions, celebrations, or having a casual date night – Stony Creek Roadhouse has an atmosphere that is suitable and fitting for many different occasions – including taking the kids for lunch for dinner. The Stony Creek Roadhouse has live music every Saturday from 6:30p-10:30p. Stony Creek Roadhouse has daily specials including 50% off your entire bar bill on Saturday nights, and kids eat free on Sundays (1 FREE Kids meal per adult meal), among many other food specials. Check this Kids eat Free deal by calling the restaurant ahead of time to make sure they still offer this deal. The food at Stony Creek Roadhouse consists of bar food, but they also offer gluten free menu items, salads, seafood entrees, gourmet pastas, fish platters, pizza, steak, chicken and ribs. Stony Creek Roadhouse Shelby is located a stone’s throw west from the Stony Creek Metropark entrance on 26 mile road.